I bought a locked TP-R40 ? now what ? Today I bought a locked R40..
hopefully this qualifies as legacy and so am in the right part of the forum ..
No hard drive in it which is as expected ..but the caddy attached to the audio IO present.. So It powers up ..and the first thing I wanted to do was enter the bios ..
held down F1 ..but instead of bios ..I get a padlock symbol with what looks like a Laptop symbol before it ..and a flashing cursor after it.. I guess this means Laptop is Locked ..and is waiting for a password ..? What are my options ? Can I get access ..or have I wasted my money ? I can re-flash chips ..and can remove and refit chips if neccessary ...but would need the chip contents in binary form to do this.. But I'm hopeful there is a way to reset it ..
Re: I bought a locked TP-R40 ? now what ? As per the rules of this forum, not allowed to discuss bypassing of passwords beyond what Lenovo/IBM provide in the maintenance manual. If it was me, I'd ask the seller for the password. If seller doesn't have it then return it. Worse case you're stuck with it fortunately you did not spend a fortune on it. Did you disconnect the bios battery? DON'T do this, it will turn a power-on password to a supervisor password. Sadly too late ..as the bios battery was already disconnected when I got it..
which is why I got it cheap I guess. Well, I was trying to find out. Talk about pouring good money after bad ..
Scoured ebay today and found a reclaim/refurb system board for £20 UKP ..
Hopefully this will get this lappy up and running ..
guaranteed working ...so hopefully no stooopid passwords set.. I seriously debated chasing this ..but it is in such excellent physical condition..I figured it deserved another chance at life. Last edited by Vipersan on Tue Jun 12, 2018 5:52 pm, edited 1 time in total. Is that a Mobile Pentium 4-M motherboard by any chance? I can not find any proper image source or a description that tells what it has on that particular motherboard for the R40, but if it is that might not be worth the money in terms of performance. There are late R40 models that had motherboards supporting Pentium M processors which ran cooler than a Mobile Pentium 4-M-equipped R40, so that got me into thinking about the worthiness of it. Thing is, are you in any way affected by the fan noise and heat produced by a Mobile Pentium 4-M? 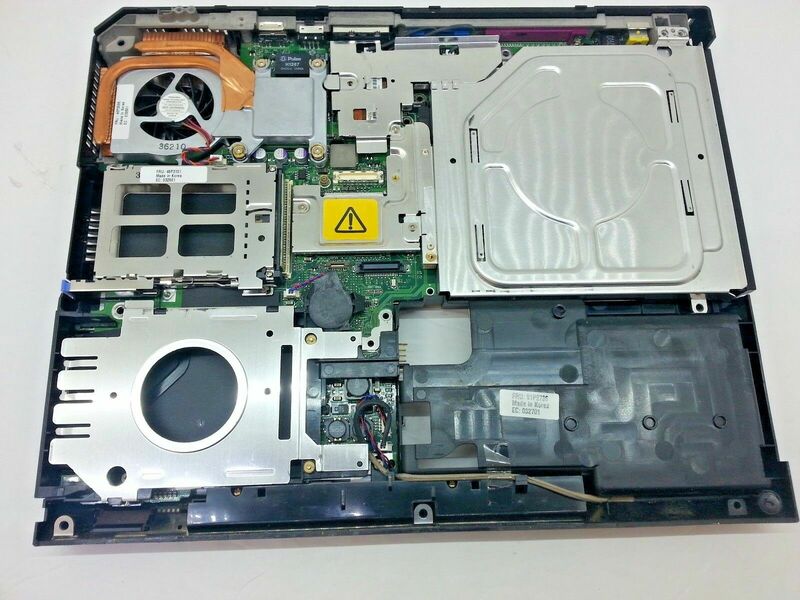 in my experience with A31p laptops, it's not so much that the fan noise and heat affecting you, but rather it significantly reduced the lifespan of the components on the motherboard. I have yet to see one A31p motherboard that hasn't suffered from problems like funky power delivery (and nearly blown capacitors). A ThinkPad R40 really isn't worth putting a lot of money into, it was designed to be a budget machine and probably was manufacutured by Acer, so don't expect it to be working for long. Well ..you guys asked me for info ..and I'm no expert with the R40 .. This is a first for me ..so I'll give you all the data I can..
Of course ..a lot of it wont be relevant once a replacement system board has been fitted.. This info relates to the current SVP locked R40. I'll add any data from the replacement board when it arrives..
R40 was still pretty fine considering quality. I'd definietely keep it in my TP collection. Or actually I do. R-series were designed as budget laptops, but this was not always at the cost of performance (R52p and its QXGA) or quality (R61i 4:3). One should ommit i-series that were developed by Acer and were of significantly lower quality. I did own couple of them, all were sheer junk compared to other laptops of their era. R40 board, or a whole unit can be bought cheaply. A ThinkPad R40 really isn't worth putting a lot of money into, it was designed to be a budget machine and probably was manufactured by Acer, so don't expect it to be working for long. The A31p's heat production caused those lifespan-reducing effects to the motherboard? Is this in any way shared with the T30 and the R32? I heard those were particularly hotter than the A31p due to their smaller heat-sinks, do those suffer similar cases of problematic power circuitry or blown capacitors? It is indeed not worth investing in, but I have noticed that most R40 models are not as prone to failing from the notorious graphics chip solder-balls-cracking-under-flexing-stress from the T40/T41/T42/R50/R51/R52. I believe it also does not suffer from a loose southbridge problem from the same said models, including the R52/T43. The only major problem I have ever noticed with the R40 is its Ultrabay that fails to work after tons of hot-swapping. Acer? Some of the R40's parts have a sticker label that says 'Made In Korea', so it is probably not Acer. According to the MTM, this is your locked R40's specifications after it left the factory. One heck of a configuration there, the Pentium M + Mobility Radeon 7500 + Firewire 400 combination means it is a very good R40 in terms of speed. If it were not for the slow 4200RPM HDD and the 1024x768 panel, you would have a very high-spec'd R40. I hope that replacement motherboard you are getting has the exact same specs as the password-locked motherboard does, I do not think Mobility Radeon 7500 R40 models were anywhere common. R40 was still pretty fine considering quality. I'd definitely keep it in my TP collection. Or actually I do. R-series were designed as budget laptops, but this was not always at the cost of performance (R52p and its QXGA) or quality (R61i 4:3). One should omit i-series that were developed by Acer and were of significantly lower quality. I did own couple of them, all were sheer junk compared to other laptops of their era. Agreed with the R40, but wasn't the R50p the only ThinkPad to have been ever equipped with a QXGA panel? Right on spot with the i-Series that were developed by Acer, they were hunks of junk in comparison to the improved Acer-produced R3x. I have R40 with locked bios. Does anyone know if Atmel chip from T41/T42 with no password will work on R40. In past I did it on one T42, but both chips were from the same Thinkpad series. I am stuck here with P4 2.0 cpu. Tried with PM 1.3, 1.5 and 1.6 with 1MB L2 but it doesn't work. My other R40 works perfectly with 1.6 PM cpu. I am pretty positive that the Pentium M version of R40 has a different motherboard, as far as I can tell from the manual, as the type numbers are separated into two parts diagrams, one with Pentium 4/Celeron, one with Pentium M.
Also, while a Pentium 4 socket may mechanically fit a Pentium M (and even at this, my Dell Inspiron with Pentium 4-M socket has one less pin than the ones on P4-M ThinkPads, thus won't even fit a Pentium M chip), the socket design is actually different. Get a Pentium M R40 motherboard and call it a day. It doesn't boot, but I do get a Green Light when I plug it in. What might it's problem be? I haven't taken it apart yet.